Today, the AHC has evolved into a network of 30,000+ public and private stakeholders across multiple working groups and partnerships who work together within the trusted framework to share information, solve problems, produce solutions, coordinate investments and low the collective risks and impacts of common threats and disasters in the "life-line" sectors of energy (electric, fuel), transportation (rail, roadways, ports), telecommunications, food, water, medical, retail, logistics, etc..
A Non-Profit. AHC is the All Hazards Consortium (AHC), a 501c3 non-profit organization established in 2005, which establishes Government-Industry partnerships to address complex operational problems. An Accelerator of Getting Business Back To Business. The AHC serves as a private sector liaison to government to help expedite information sharing which results in removing operational delays to restore businesses and supply chains faster. A DHS Approved, Annually Audited & State Sanctioned Organization. The AHC is a fiscally responsible organization that has manages millions in federal & state grant funds; is audited annually; and its trusted by state and local governments as a key public/private partnership. An Operational Trust Framework. The AHC facilitates and manages a Trust Framework comprised of legal, policy, procedural and technical components designed to support integrated public/private planning and sensitive information sharing. A Partnership and Resource Engine. The AHC provides information and links you to needed resources and organizations during regional disasters. A Research Transition Accelerator. The AHC shortens the time it takes to move early stage R&D solutions into real world operational environments in the private sector which benefits both the critical infrastructure owners, the researchers and the investors. A Sensitive Information Sharing Hub. The AHC operates a legal trust framework that provides the needed assurances to the public & private sector to share sensitive information safely and efficiently without legal issues via their Sensitive Information Sharing Environment (SISE) Working Group. 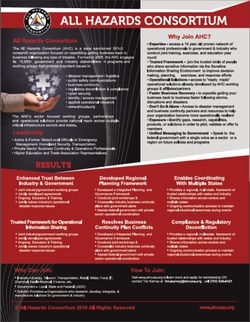 A Regulatory Compliance & De-Confliction Partner. By connecting public & private operations professionals, the AHC allow private sector to address compliance issues more effectively and creates the environment for clarifying and/or de-confliction requirements. The All Hazards Consortium will support the efforts of organizations and individuals to improve their ability to handle emergencies of any kind. The AHC exists to form a network of organizations and individuals who share a common interest in improving the capacity of our region to prevent, prepare for, respond to and recover from crises. We strive to unite these stakeholders around a common culture where public benefit takes priority over profit, politics or professional gain. The AHC engages and serves State/Local governments and the critical infrastructure owners and operators. We welcome and encourage participation by businesses; education and research institutions; not-for-profit organizations throughout the region; and Federal Government agencies. Our programs focus on the needs of our stakeholders are open to everyone whose interests align with our objectives. 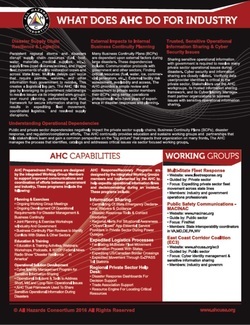 The AHC provides a national reach with regional focus on a wide variety of issues including disaster management / logistics, public safety communications, business continuity, regulatory de-confliction & compliance, sensitive operational information sharing, cyber security, identity / access management, community resilience, and applied operational research. The AHC fosters trusted relationships among participants; enhances regional planning; creates a common voice and enables the identification and sharing of resources and information that supports disaster preparedness, response and recovery efforts. Our actions engage and complement existing organizations – including the Federal Government – which are working in this area.